I’ve mentioned numerous times that I am not much of drinker. After about an ounce of liquor, I get all flushed and start talking way too much. However, even though I’m not a huge fan of getting my drink on – my friends are. My BFF, Brittani turns 35 tomorrow, so I teamed up with a group of friends to throw her a surprise party last weekend. At some point during the party planning, someone mentioned pudding shots, but the task was never really delegated to anyone in particular. And since I’m a crazy overachiever, I decided to add them to my party to-do list on top of Greek Pasta Salad, Peanut Butter Cup Cupcakes, and Queso Blanco. While strolling through Kroger, I came across mini, plastic shot glasses and spoons in the paper plate aisle. I’ve only had pudding/jello shots a couple of times since I typically refrain from awkward eating situations that force you to use your mouth to remove jiggly things from little cups, so I thought the spoons were quite genius! When thinking of flavor combinations, I thought S’mores Pudding Shots would be perfect for our casual, outdoor party – plus, I had half a bottle of Fluffed Marshmallow Vodka that we haven’t touched since I made S’mores Truffles. 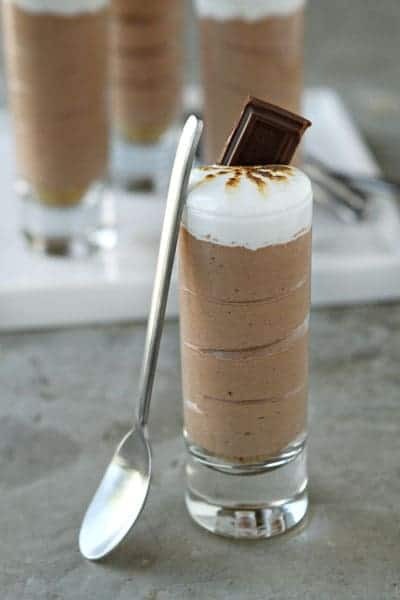 Pudding shots couldn’t be easier and they can be dressed up as seen in the photographs, or simply piped into mini plastic cups for a casual backyard barbeque. Chocolate pudding mix combines with milk, Fluffed Marshmallow Vodka and Cool Whip to create a fun, simple and boozy sweet treat that’s sure to be the hit at any party. Regardless of how you serve this adult spin on the campfire classic, make sure you let your guests know that they contain alcohol – because they’re so incredibly delicious one could easily overindulge. In a large bowl, whisk together the chocolate pudding mix and milk until thick and smooth. Add in the vodka whisking until the mixture is free of lumps and well-combined. Fold in the Cool Whip and mix until no white streaks are visible. Set Aside. Spoon or pipe (I used a medium French tip) the Marshmallow Fluff directly onto the pudding mixture. If desired, use a kitchen torch to carefully brown the Marshmallow Fluff and garnish with a piece of the Hershey’s Milk Chocolate Bar. Mini Cordial Glasses are from Pier 1 Imports, the spoons are from Ikea. Using the Mini Cordial Glasses seen above will yield 8-10 servings. If you want to yield more servings, I would suggest using smaller shot glasses such as these plastic ones. By using the 1.75 ounce glasses, you’ll end up with about 20 shots. I picked mine up from Kroger in the paper plate aisle.